December 1, 2010 - Singapore Airlines Cargo Pte Ltd. has agreed to plead guilty and to pay a $48 million criminal fine for its role in a conspiracy to fix prices in the air transportation industry, the Department of Justice announced on Tuesday. According to a one-count felony charge filed today in U.S. District Court for the District of Columbia, Singapore-based Singapore Airlines Cargo engaged in a conspiracy to fix the cargo rates charged to certain customers in the United States and elsewhere. For international air shipments from as early as February 2002, until at least Feb. 14, 2006. Under the plea agreement, which is subject to court approval, Singapore Airlines Cargo has also agreed to cooperate with the department?s ongoing antitrust investigation. Singapore Airlines Cargo transports a variety of cargo shipments, such as heavy equipment, perishable commodities and consumer goods, on scheduled international flights, including to and from the United States. According to the charges, Singapore Airlines Cargo and co-conspirators carried out the conspiracy by agreeing during meetings, conversations and other communications on one or more components of the cargo rates to be charged for shipments on certain routes to and from the United States. As part of the conspiracy, Singapore Airlines Cargo and co-conspirators levied cargo rates in accordance with the agreements reached, and monitored and enforced adherence to the agreed-upon cargo rates. Singapore Airlines Cargo is charged with price fixing in violation of the Sherman Act, which carries a maximum fine for corporations of $100 million. The maximum fine may be increased to twice the gain derived from the crime or twice the loss suffered by the victims of the crime, if either of those amounts is greater than the statutory maximum fine. Including yesterdays charge, as a result of this investigation, a total of 20 airlines and 17 executives have been charged in the Justice Department?s ongoing investigation into price fixing in the air transportation industry. To date, more than $1.7 billion in criminal fines have been obtained and four executives have been sentenced to serve prison time. Charges are pending against the remaining 13 executives. Yesterdays charge is the result of a joint investigation into the air transportation industry being conducted by the Antitrust Division?s National Criminal Enforcement Section, the FBI?s Washington Field Office, the Department of Transportation?s Office of Inspector General and the U.S. Postal Service?s Office of Inspector General. Singapore Airlines Cargo (SIA Cargo) is the world's third-largest cargo airline in terms of international freight ton kilometres (FTK) Formed in 2001, it is a wholly-owned subsidiary of Singapore Airlines. The carrier has a dedicated flight network spanning 36 cities in 18 countries managing an 8-billion-tonne-kilometre capacity through a fleet of 11 all-cargo aircraft and the cargo holds of 108 passenger aircraft operated by Singapore Airlines. The airline is part of the WOW Alliance, which also includes SAS Cargo Group and JAL Cargo as members. The airline owns a 25% stake in Great Wall Airlines, a new cargo airline based in Shanghai. In December 2008, Singapore Airlines Cargo was alleged by the Australian Competition and Consumer Commission for price fixing cartels in the air cargo industry. The ACCC accused Singapore Airlines Cargo of fixing the price of a fuel surcharge and a security surcharge that was applied to air cargo to and from Australia. 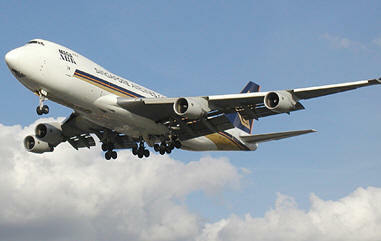 Singapore Airlines Cargo is the third airline to be the targeted for fuel surcharge price fixing. In May 2010, Singapore Airlines was fined by the Fair Trade Commission (South Korea) for conspiring to introduce fuel surcharges for freight cargoes or continued to raise them over the past seven years. Singapore Airlines Cargo released a statement saying that they are "very disappointed" and "will study the decision closely with a serious view towards mounting an appeal" once they receive the Commission's full reasoning.